Our prayer license carries the signature of Christ and we honour him by growing in it. Packing away the prayer license for any reason – choosing to no longer pray – is uncommon. Less uncommon is the habit of under-using it. Under-use could refer to too little prayer, but I’m thinking more of prayer that has too little reach; a prayer stretch that doesn’t reflect the largeness of the license. We get used to our familiar prayer shoreline. For many, it’s made up of prayer for personal needs (our own or of those close to us). Praying for our needs is good, but is not meant to monopolise our asking. 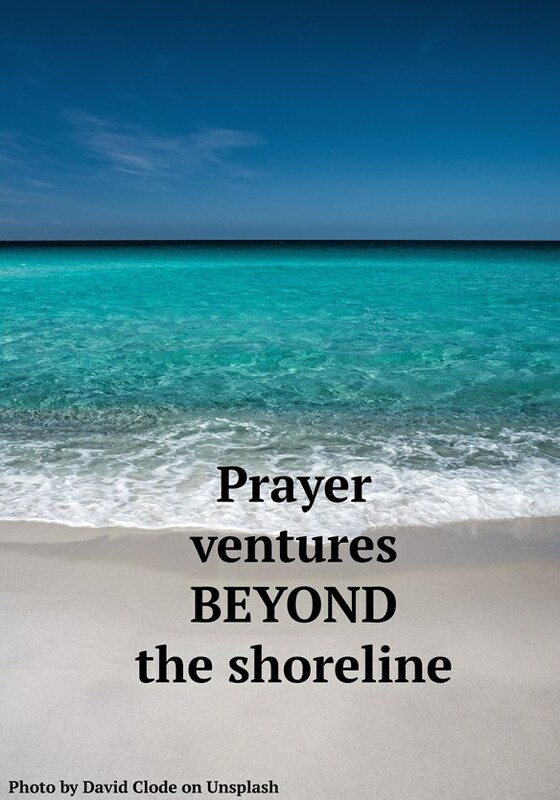 Prayer life adventure is one that values shoreline praying, but keeps us reaching beyond it to explore the ocean of authority we are licensed for. When Jesus gave his disciples a guide to praying, he purposely put the ‘give us daily bread’ bit after the request for his Kingdom to come. Not because their personal needs were unimportant, but because his Kingdom’s advance is supremely important. He wanted to be sure they didn’t stop at the shoreline without exploring the ocean. Every day is a fresh prayer mission. We’re exposed to local and global impossibilities: turmoil, injustice, brokenness and spiritual resistance in places where human effort is powerless. Christ is the only solution and He has connected his answers to the wholehearted use of our prayer license. Jesus spoke to disciples about prayer that moves mountains. He obviously wasn’t promoting a landscape reshaping ministry, but was encouraging a mindset fixed on the enormous authority of the prayer license. He was coaching them to ask for the big and impossible when those are the kinds of answers needed to make a difference. Faced with a crowd that needs feeding, Jesus turns to Philip and asks where enough bread can be found. While Philip is doing the math, the Spirit adds an aside comment: Jesus “already had in mind what he was going to do.” Before the tiny portion of bread and fish turned up, Jesus’ mind was already set on a supernatural answer to an impossible need. The full (growing) use of our prayer license requires that we set our minds on extraordinary answers that only God can give – and then shape our asking accordingly. We will always be trainee pray-ers, learning to move our asking a bit further from the familiar shoreline, learning to stretch our asking to match the size of his desired answers. Prayer discouragements happen. But we can’t let today’s prayer reach be shortened by yesterday’s disappointments, or by the ‘is it making any difference’ doubts. We keep reaching for more in honour of the Name that underwrites our prayer license. What familiar needs do you regularly pray about (your shoreline)? Thank him for the freedom and authority to bring them into face-to-face time with him. Now plan a venture beyond your shoreline; for some a new journey, for others a fresh one. Read, observe, research: where/who can you touch through your prayer authority? A community in need of transformation, a nation in turmoil, a people group unreached by the gospel, a struggling indigenous church, a city rife with social injustice? What answer from God will draw attention to him and make a difference there? Listen to his heart and, with confidence in his Name, let the desired answer shape the size of your asking. Then go ahead and plan your next venture beyond the shoreline.